Wallflowers store scented oil in a bulb-shaped reservoir. 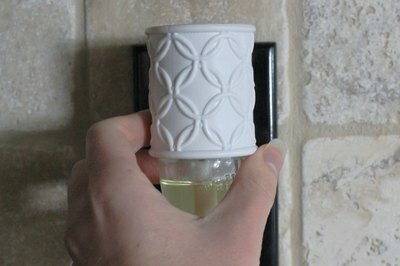 When the Wallflower is plugged into an electrical outlet, the oil warms and the scent is released through the flower-like top of this air freshener. Wallflowers provide continuous fragrance as long as the oil lasts, but once the oil dries up, the scent stops. Constantly replacing the Wallflower with the refills designed to fit it can be expensive. 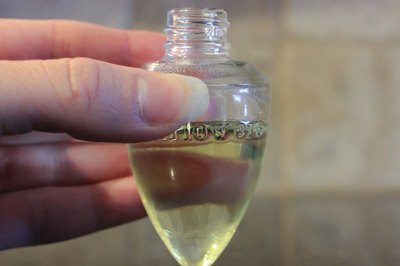 A more economical alternative is to make your own scented oil to refill the reservoir. Combine 1/4 cup oil with 2 to 3 drops of essential oil. Stir or shake to mix well. Set aside. Remove the Wallflower from the electrical outlet and unscrew the oil receptacle from the flower part of the Wallflower. Hold the oil receptacle with the wick pointing up. Slip the blade of the screwdriver beneath the plastic covering around the wick and carefully work the blade all the way around the top of the oil receptacle. Work slowly, lifting the plastic a little bit at a time until it pops loose. 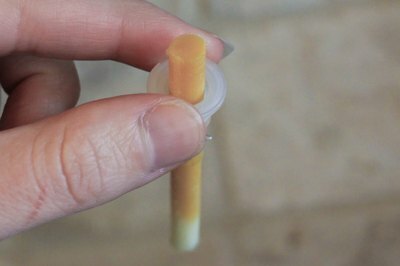 Remove the wick and the plastic piece from the neck of the oil receptacle. 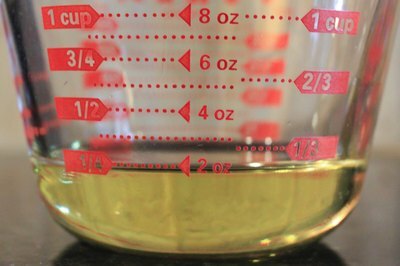 Pour the oil mixture into the oil receptacle, using a small funnel. Fill the receptacle 2/3 full. Dip both sides of the wick in the leftover oil to moisten the wick. Replace the plastic cap and the wick on the oil receptacle. Hold the oil receptacle in one hand and press down firmly on the cap with the other hand. You may need to rock the plastic back and forth a little to force it back into the neck of the oil receptacle. It will be a very tight fit, but with patience, it will go back in. Hold the oil receptacle with the wick pointing up and screw it into the flower part of the Wallflower. Plug the Wallflower into the wall. Try lavender and other floral scents, vanilla, cinnamon or other spices. If you don't have a small funnel, you can use a large syringe to fill the oil reservoir. Don't overfill the wallflower. Oil overflowing the container could cause a fire. Don't allow undiluted essential oils to touch bare skin, as they could irritate or burn the skin. Wash away any oil that comes into contact with skin with soap and water. Don't leave the Wallflower unattended.